Our beautiful Golden Eagle, Wankan Tankan, passed away Jan. 24, 2018 from cancer. He was a beloved ambassador for his species. Wankan is sadly missed by all his caregivers. 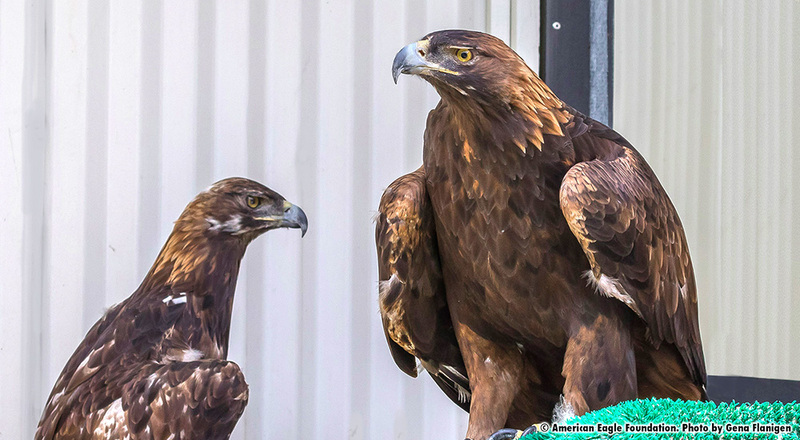 ‘Wankan Tankan’ and ‘Cheyenne,’ permanently disabled, non-releasable Golden Eagles, were transferred to the American Eagle Foundation in Pigeon Forge, Tennessee to be forever cared for. In the spring of 1999, Wankan Tankan and Cheyenne were introduced to each other. They bonded and hatched and raised numerous young as a part of the AEF’s Captive Breeding and Hacking programs. They also hatched and fostered several Bald Eaglets from other Bald Eagle pairs at the American Eagle Foundation. ‘Wankan Tankan’ was with the American Eagle Foundation since 1986. He was injured when he collided with a power line in Colorado, breaking his wing. Although he was capable of flight, the wing did not heal well enough for him to be able to hunt on his own in the wild. He arrived at the AEF with a mate, Sundance, who he met while staying at a rehabilitation center in Colorado. Wankan Tankan means ‘Great Spirit,’—which this bird is. 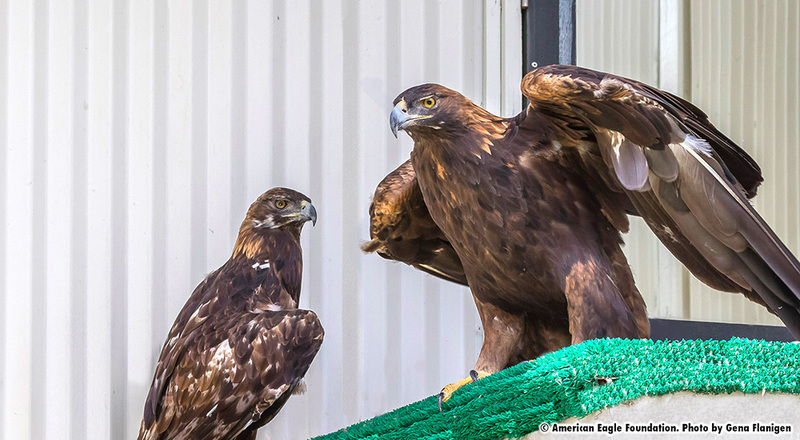 He was the father of every Golden eaglet raised and released into the wild from the AEF facility. He and Sundance successfully produced three youngsters between 1990 and 1998. All of the young produced were released into the wild at twelve weeks of age. He was a very good parent. As with all eagles, both parents incubate the eggs and raise the young. Unfortunately, in 1998 Wankan Tankan lost his mate, Sundance. In the spring of 1999, the AEF introduced him to a new Golden Eagle named Cheyenne. Wankan Tankan passed away on Jan. 24, 2018 from cancer. He is missed beyond words. Cheyenne was found by a game warden on the side of the interstate near Casper, Wyoming on February 12, 1997, and was taken to Lois Layton, a rehabilitator in Casper, for treatment. Her left wing was fractured in several places and some bone was exposed. She arrived at the American Eagle Foundation in Pigeon Forge on March 12, 1999. When given her first physical, the AEF found that she has a single white tail feather. 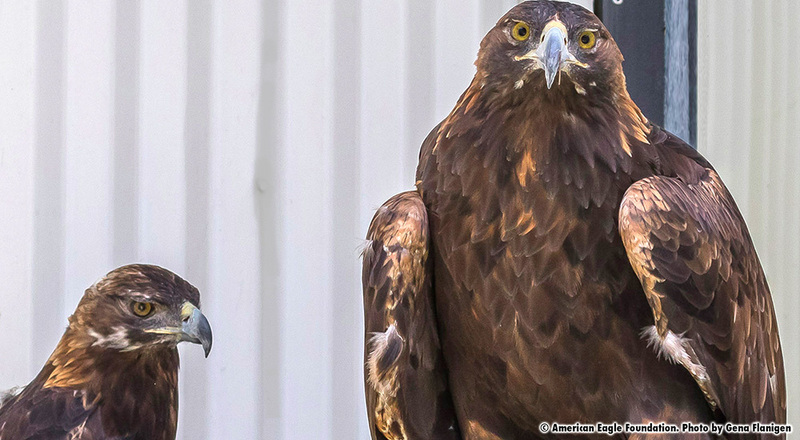 This is very unusual for Golden Eagles. She was introduced to Wankan Tankan in 1999. The Golden Eagle gets its name from the beautiful golden colored feathers found on the back of its head and neck. They are the most common type of eagle found on every continent in the northern hemisphere. A strong and powerful flyer, they delight in soaring through gale force winds and have been known to climb thermal updrafts up to four miles high. They’re cunning, intelligent, and bold, diving in from the sun to blind their prey and using stealth like tactics to cut off its means of escape. Golden Eagles are fierce and strong hunters. They have an unbelievable 1200 pounds of crushing power per square inch in each foot! Learn more about Golden Eagles.